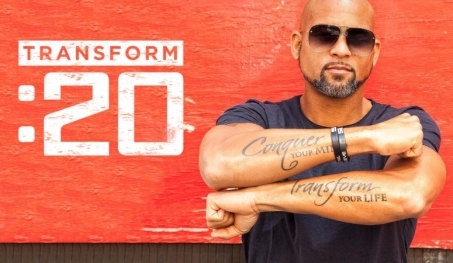 Conquer your mind & transform your life with Transform :20! Introducing the newest program from super trainer Shaun T. Scorch fat, flatten your stomach, lean out, and sharpen your focus in only 20 minutes a day, 6 days a week. Interested in trying out Transform :20 for yourself? A step is the only equipment you'll need! Transform :20 is great for Shaun T-lovers, as well as anyone who wants quick workouts, minimal equipment, and built-in motivation!! As always, there will be a modifier so you can fit the workout to your fitness level and abilities. There are no weights needed for this program - you'll be using just your body weight and a step to transform yourself from the inside out! Learn more about Transform :20 here. When does Transform :20 launch? VIP Access to Transform :20 launches January 14th, 2019, and the program will be available to everyone with Beachbody on Demand on April 1st, 2019. If you are interested in staying up to date on launch and product details complete the form above and I will be the first to let you know when the program is available for purchase. Plus, I am going to be hosting a Transform: 20 customer experience group and if you want support and accountability make sure to complete the application to get on the list!!! I have been selected to participate in the Transform :20 Test Group, and I cannot wait to share my journey through the program with you! I will be starting the test group on Monday, September 24th so you can follow my journey on my Instagram Stories and Instagram feed to see the transformation! I have a special place in my heart for Shaun T because Insanity was actually the first program that I did as a customer. 7 years ago on May 2nd, 2011 I started my journey to losing the weight after having my 2 boys. I took my old Dell laptop down to the storage room of our townhouse and pressed play while the boys napped 6 afternoons a week. I swore at Shaun T, I cried, and I definitely did not think my body was actually going to change. After the first month I took my photos and I could see it. I was getting stronger, I was losing the weight but it was in month 2 that Shaun T totally rocked my world and took my fitness to the next level. I lost 11 lbs with Insanity and then went on to tackle P90X. I have never looked back and I have kept the weight off for 7 years strong!! My mission is to help other people achieve a healthy and fulfilling life and give them the same supportive community my coach gave me as I was starting out!